In a world where angry rants and violent outbursts seem to be proliferating as a means to deal with differences, my heart aches with the seeming impossibility of people to have civil discourse without resorting to violence as the answer to ideological differences. With the news of the attack on two New Zealand mosques and the continual bursts of racial slurs with politicians like Maryland Delegate Mary Ann Lisanti and protests by high school students in New York over a racist video at the private school of Ethical Culture Fieldston School, it’s time to stop violence and begin communication. No one ever said communication does not work to resolve differences. It’s just that it’s hard work and we don’t want to put in the effort to possibly see things differently than we do now. How can we grow as human beings unless we do try to listen, understand, question ourselves, and examine our passions? Who is perfect that can cast the first stone (cf. John 8)? Who are we as Christians if we think that this behavior of not respecting the dignity of every human person is acceptable? We all should be outraged. And yet, we don’t seem to be affected enough by the violence to stop the insanity. It takes courage to stand up for what is right. It takes humility, honesty, and reflection to see when we are wrong and how we can change to be a better human being, making the world a little better place to live because of us. An incredible true story offers us an example. The Best of Enemies is a film written and directed by Robin Bissell based on the book by Osha Gray Davidson, which addresses the clash between civil right activist Ann Atwater (Taraji Henson) and Ku Klux Klan leader C.P. 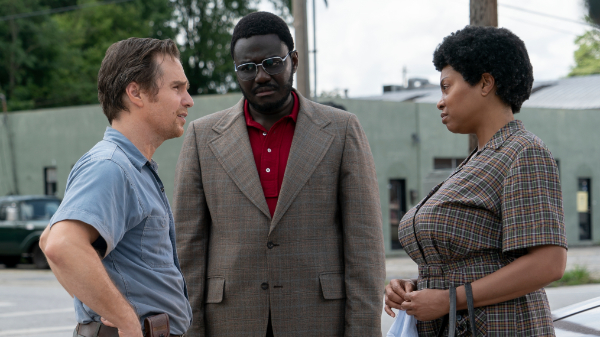 Ellis (Sam Rockwell) in 1970s Durham, North Carolina. The two come together in 1971 after a decade of battles, to agree to co-chair a town meeting to deal with the desegregation of schools, especially after the black school burned down. The two reluctantly agree. The most interesting thing about this story is that even though Carvie Oldham (Bruce McGill) initiates this conversation to save his political career, through an advisor, he brings in Bill Riddick (Babou Ceesay), an African-American professor at Shaw University in North Carolina to organize a charrette in order to help both sides of the issue to communicate. It sounds simple, but in reality, how do you get opposing sides to even come together to talk? This is why this story needs to be told. Photo credit Annette Brown. Motion Picture Artwork @2018 STX Financing, LLC. All Rights Reserved. The many critics of the film feel that this is a “white savior” story for the black community and reject it. I suppose you can look at it that way. What I see is more how communication supplants violence. When Ann and C.P., along with representatives from their respective communities attend the charrette they remain as stubborn as ever. At the beginning of the film C.P. is elected leader at his local KKK meeting. When he was a young man it was told him that he will no longer be an outsider when he receives his Klan identity card. It was a place for him to belong, something he lacked in life. But, regardless of the Klan’s motto, “The crowing glory of a Klansman is to serve,” the means to achieve “service” is violence toward fellow human beings, something incomprehensible in my mind. So, both sides face each other at the charrette when tensions run high. Riddick even has them pair up from opposite sides to have lunch together one-on-one to discuss anything but the issue of desegregation. C.P. and Ann face each other with little success at conversation until Ann realizes that C.P. is dealing with a mentally handicapped son in a care facility. His anger at his inability to help his son who retreats in fear when another patient is roomed with him preoccupies C.P. at the charrette. When Ann finds out that C.P. cannot afford to pay for a private room for his son she finds a way to assist him. This is the catalyst for his change of heart. C.P. begins to see the humanity in Ann, and she towards him. We are all human beings struggling to live and work within a challenging world. And yet, somehow we are all the same. We all want what is best for our children. The tensions disintegrate and true humanity shines forth. If communication will not solve differences, than what will? How much more violence do we need before we realize that we are not getting any closer to resolving conflicts? It takes the courage and humility of the Anns and C.P.s of this world to take a stand and come together in true human understanding and love. It’s no wonder they remained friends all their lives. That type of communication can only transform us and see the other person for who they really are—a child of God!